Room for Two: Alder cabinets, honed granite countertops and a tumbled marble backsplash give this kitchen a rustic feel. The homeowners of this 1920s house (pictured above) had been planning a kitchen remodel for a long time. They went so far as to work on a design that would enclose the porch to expand the space, then got cold feet during the market downturn, and, worrying about the return on investment for an addition, put the project on hold. By the time designer Diane Lawson, of Diane Lawson Designs in Nashville, TN; met the couple, they had revisited the project but had opted to stay within the existing footprint. However, they presented her with a long list of desires that included: good traffic flow for two cooks, separate cooking areas, an island, increased storage, and a rustic Italian design and details that would blend with the home's Italianate style. Though most homeowners today want to open up the kitchen to the rest of the house, Lawson says this couple bucked the trend, choosing to maintain the separation from the living and dining rooms. Fitting in the long list of the client's wants required some compromise, including a peninsula rather than an island, but Lawson viewed the project as putting a puzzle together to set all the pieces neatly in to the outline. Window & Wall Upgrade: When the original windows were replaced with low-E units, insulation was also added to the exterior wall. To help create a rustic Italian feel, the clients chose knotty alder cabinets. Lawson says that this species has increased in popularity during the last 10 years and that the wood - sometimes referred to as "poor man's cherry" because of it's similar grain and reddish tones - can cost 10% to 15% less than cherry. Since not all manufacturers carry alder, Lawson opted for custom cabinetry. Going with a custom shop also had the advantage of enabling her to maximize storage and create a furniture look with cabinets that fit the age and style of the house. "[The choice] boils down to [the client's] wish list and what they are looking to achieve," Lawson explains. "And, of course, budget." The clients wanted to use the same finish throughout the kitchen - a rare choice these days, Lawson says. Currently, most of her clients are opting for a contrasting finish for the island. Lawson had known remodeler Michael Menn, of Michale Menn Ltd., in Chicago, for almost 20 years and brought him on to help her with the extensive remodel. The ceiling above the sink had a soffit. Menn removed it to accommodate Lawson's design, which took the cabinets to the ceiling to provide extra storage. One of Lawson's biggest design challenges was the traffic pattern for the family's two "heavy-duty chefs" and keeping them out of each other's way. The original freestanding island really affected the pattern, so Lawson moved the island to abut a wall. "While you don't have access on all four sides [of the island]," Lawson says, "it gave us more room in the busy aisle-way, which is the main entry into the kitchen and is where we needed as much space as possible" - especially when one of the cooks is standing at the island prep sink. The island has a small trash cabinet and a shelf for the client's heavy stand-mixer. Into the fold: Removing the door and adding upper and lower cabinets makes this former pantry feel like part of the main kitchen. Cook Nook: The second pantry has a microwave and an oven. The existing laundry chute remains - but it has been reframed to match the cabinetry. The existing 360-square-foot kitchen included two under-utilized pantries. Lawson thought the 18-square-foot closet next to the stove alcove would work better as a butler's pantry, so Menn removed the door to make it part of the kitchen and replaced the wire-rack shelves with cabinets that match those in the main kitchen. The L-shaped run of cabinets has upper and lower cabinets and a countertop. An undercounter wine refrigerator is the only appliance. The other 24-square-foot closet is closer to the dining room. Lawson considered removing the walls to incorporate it into the dining space, but there were two obstacles to doing that: a laundry chute in the closet and a two-story chimney that runs adjacent to that pantry. "We were bound," Menn says, but the team also thought that retaining the quaint "little pockets" of space matched the style of the 90-year-old home. As they had done with the other closet, the crew removed the door. The existing closet had some shelves, an outlet, and a hanging bulb. The new space contains an oven, counter space, and upper shelves with a microwave. The wife likes to bake, and this area gives her a space to work in while her husband prepares food in the main kitchen area. The original cooking alcove was outlined with faux brick. The clients liked the idea of a brick alcove and felt that it fit well with the new design's rustic feel. And, Lawson says, the material ties in with the brick porch outside the kitchen. Menn and Lawson thought the alcove could be enhanced to make more of a statement, so Menn's team created a taller, softer arch at the top of the opening and installed real brick - cut ¾-inch thick - on the entire wall, as well as on the wall adjacent to the butler's pantry. The alcove also has contermporary features, including a sleek stainless steel hood, a Wolf cooktop, and a stainless steel storage drawer custom-made by the cabinet shop. The hood is actually made for an above-island installation that the clients had considered for the addition version of the project. They liked the shape, so Menn installed it here. 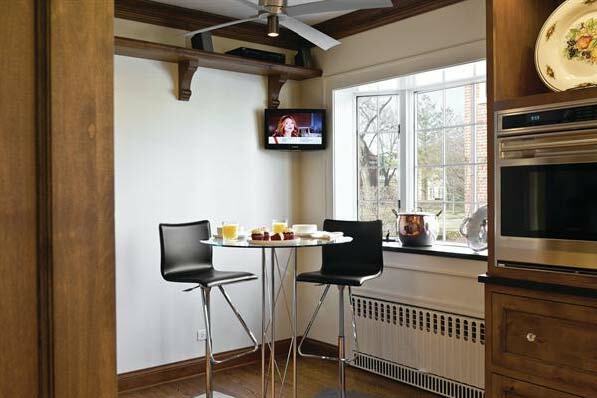 He made custom ductwork to meet local code and vented the hood through an exterior wall. Narrow base pull-out cabinets flank the stove and hold spices.